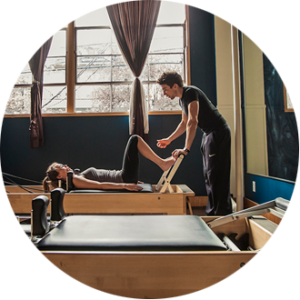 When Joseph Pilates came to the U.S. and established his New York studio, many of his first students were professional dancers. As athletes, dancers need to maintain top physical condition but also know how to protect themselves from repetitive injuries due to their rigorous training and performance schedules. Since then, professional athletes around the world have added Pilates to their training routines to develop core strength, assist in rehabilitation after injury and create muscular balance throughout the entire body. Athletes know that flexibility is a key component to avoiding injury — and passive stretching is NOT always the answer. Pilates exercises incorporate eccentric muscle activation — that means actively lengthening while strengthening your muscles — which is essential to strength and flexibility. That’s why Olympic athletes, NBA, NFL and MLB professionals have added Pilates to their training regimens. For athletes participating in sports that by nature lead to body imbalance, such as golfers or ice skaters who are always moving in the same direction, Pilates helps them strengthen their weaker side and increase flexibility on their tighter side. It’s a similar case for runners, hikers and cyclists who are constantly moving in forward, parallel motion, and need to add rotation and side-to-side movement to increase their performance and reduce the risk of injury. To keep the body balanced you must train in all available planes of movement to create strong, yet flexible muscles. True core strength is 3 dimensional – meaning from the top of the shoulders to the base of the pelvis and from the front of your body to the back. There is a strong focus on rotation and on working the core in different planes of space: on your back, on your side, on your stomach and even standing. A strong core and good posture will work your muscles more efficiently, allowing you to increase your athletic performance safely, whether you are a professional athlete, a weekend warrior, or the occasional hiker. Try adding Pilates twice a week or more to your workout routine and you’ll be surprised at the difference it will make increasing your athletic achievements, and in reducing your recovery time with fewer aches and pains.